A charity which helps to transform the lives of over 5,000 people with physical, sensory and learning disabilities each year is in line for a loan from Northumberland County Council to expand its activities. Calvert Trust Kielder is looking to provide more quality accommodation for its visitors by freeing up and revamping two chalets on its site near the shore of Kielder Water. To do this the charity needs to purchase new accommodation nearby for staff, and it has looked to the council for support. The proposal is for Northumbria Calvert Trust to purchase two staff houses in or around Kielder village so that two chalets on the site can be redeveloped. The Calvert Trust is the inspiration of John Fryer-Spedding, whose vision was to enable people with disabilities to benefit from outdoor activities in the countryside. The first centre opened in the Lake District in 1978 and the Kielder centre opened in 1984. 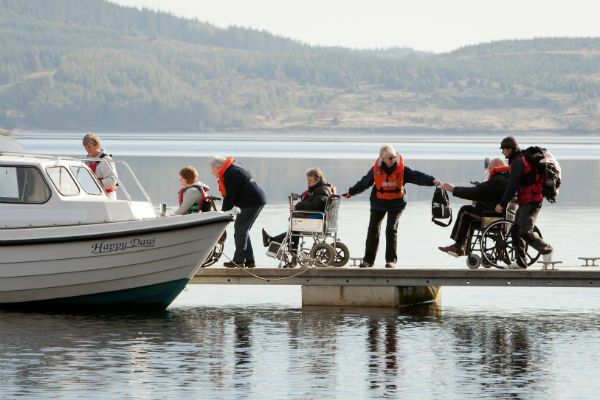 Calvert Trust Kielder welcomes families, groups and individuals on a residential and day visit basis and uniquely offers 24 hour respite care for adults travelling alone. As well as a range of activities, the site currently offers 10 fully accessible self-catering log chalets, the fabulous 5* Straker Chalet and the special Sky Den, created by George Clark's Amazing Spaces Channel 4 TV programme. The Bradbury, a luxury chalet sleeping 4 people, opened summer 2015 and the latest addition, The McArdle, opened early 2016. The council’s loan and subsequent work will allow the two existing chalets to be developed to a four star standard. Northumberland County Council is considering a loan facility of up to £300,000 repayable over 20 years through the additional income generated by the chalets. Cllr Scott Dickinson, business chair of Northumberland County Council said: “This charity does remarkable work in providing holidays for people with disabilities and their families. “When they approached the council we really wanted to help. Given the current financial climate and challenges the council faces it was considered that a repayable loan would be the best way to do this, and this is what is being considered. “It will represent minimal risk to the council due to the terms and conditions that will be set on the loan and that fact that it being guaranteed by assets. CEO of Calvert Trust Kielder Peter Cockerill said: "We are absolutely delighted that Northumberland County Council is considering the loan for Calvert Trust Kielder. "The Council's positive feedback and continued generous support for Calvert Trust Kielder as both a charity and local business is greatly appreciated by us all and we look forward to the final decision." The Trust is currently looking for suitable properties for staff in and around Kielder village. The proposal to provide a loan will be considered by the full council on 22nd February.